Since the Fed announced the reduction in securities purchases ("small taper"), the treasury curve has undergone some strange adjustments. Here is what the impact has been since the close on December 17th. Why would the 5-year note sell off the most while the long bond rallied? The trade that takes advantage of this view is the so-called "steepener" trade - long short-term treasuries and short long-term treasuries. And that's how the market was positioned going into the announcement. But a combination of the "early" taper, stronger than expected economic data (below), and a less than stellar 5-year note auction made some question the #2 assumption above. After what we've seen over the past five years it is difficult to imagine this scenario, but what if the US economy unexpectedly accelerates? The Fed will be forced to begin pushing short-term rates up faster than originally expected. The market started to price in a higher probability of just such an event. 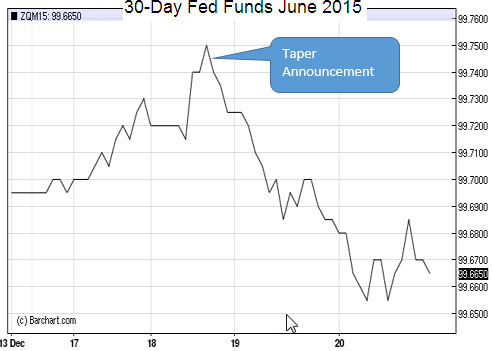 As an illustration, take a look at the June-2015 fed funds futures contract. The steepener trade had pushed the first rate hike expectations further out in time (higher futures price = lower expected fed funds rate). But the announcement, combined with improved economic data, forced a selloff in the contract - with the market now expecting the first hike by the middle of 2015. This earlier-rate-hike scenario impacts shorter-term treasuries more than it does longer-dated notes/bonds. The adjustment in expectations forced an unwind of the steepener trade, creating the "flattening" move in the yield curve we see in the first chart above. Anecdotal evidence suggests that this unwind ended up being quite painful for a number of market participants who had piled into the trade.